What could be more special than an easy-to-prepare casserole of sea scallops poached in a wonderful white wine and cream sauce, dotted with bright green specks of chives? Serve with lots of crusty bread to sop up the sauce. Melt the butter in a small saucepan over medium heat. Add the shallots and cook until soft. Stir in the flour. When the flour begins to foam, stir in the vermouth and mustard. Cook until the sauce thickens, about 4 to 6 minutes. Add the cream and season with salt and pepper. Cook until the sauce is heated through. 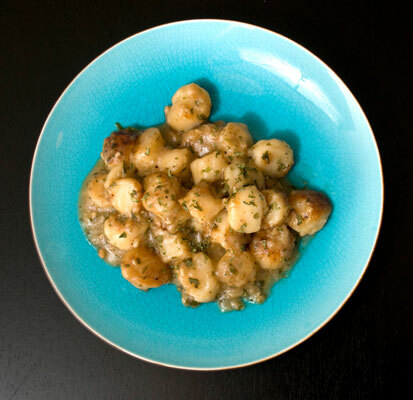 Place the scallops in a small Dutch oven or other covered baking dish. Spoon the sauce over the scallops. Cover and bake on the center oven rack for 10 minutes. Remove from the oven. Stir in the chives and serve immediately.